Home / Makeup / All hail the Chanel beauty cab! All hail the Chanel beauty cab! On what has to be the world’s shortest trip ever to London yesterday (7 hours, counting time to-and-fro from the airport) I managed to spot not just one but two of the gorgeously eye-catching Chanel cabs that are stalking the city streets this month. Dressed up in the brand’s iconic nail polish and lipstick hues, these pretty-pretty-pretty Hackney Carriages come in a strictly limited edition of 25 and are loaded with beauty treats for the lucky passengers. Yup! 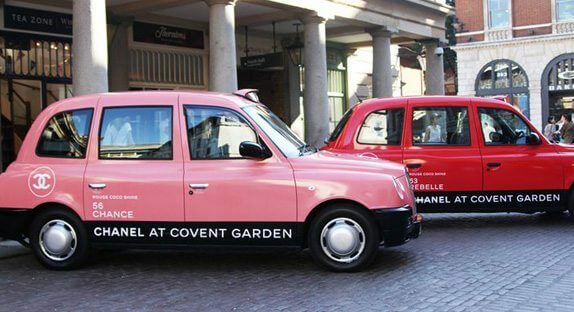 All you need to do is hail one of these Double-C emblazoned cabs, say “Chanel at Covent Garden” to the driver and receive a complimentary makeover or nail shape and paint, along with a £25 voucher to spend on your favourite Chanel make-up products on the day at the now-iconic Pop Up store. The offer runs from 3rd – 17th September 2012, so start looking out NOW! And if you nail the trip (bad pun – sorry!) do tell me about your experience so I can at least live the glam life vicariously! Grin… isn’t it simply gorgeous? I couldn’t believe my eyes. Only regret is that I didn’t have the time to hail a ride. Wish I could go back to London before the 17th!!!! Since the Olympics, I’ve been telling my husband I want to move to London. I think this will convince him. You have a husband who would move to London for Chanel? Sigh! How do I get one of those??? ?